Bumpus Harley Davidson raised thousands of dollars for Forever Young as the Collierville motorcycle shop hosted its first-ever sanctioned mix martial arts charity fight. The money was raised to help return Normandy D-Day veterans back to France for the 70th anniversary. Bumpus, 98.1 The Max, and The Trophy Room sponsored the sold-out “Havoc For Heroes” event, which raised $11,000 for the aging heroes. 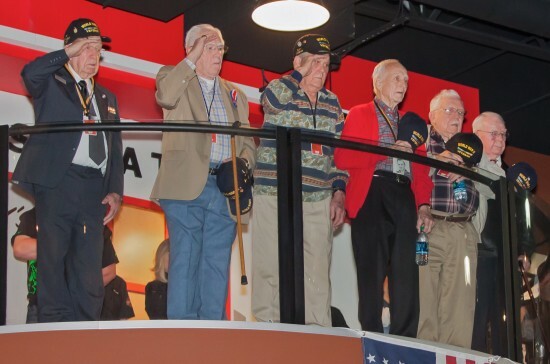 Before the fights started, Gideon Sullivan of Havoc MMA said to the WWII veterans in attendance, “You fought for us and now it’s our time to fight for you.” The crowd cheered and gave a standing ovation to the veterans as they stood on a second level balcony (see attached picture). Forever Young is extremely grateful that there are people like Joe Kilpatrick, Jerry Bumpus, & Jim Church who truly understand the sacrifice of our WWII veterans & are willing to work hard to make a difference in their lives. Our Normandy veterans will never forget it.